Ecommerce website builder and hosting. So your business has a great product or service, but now you want to take the next step and start selling online. What you need is an eCommerce website builder. Ecommerce simply means “electronic commerce”. When a web site has the ability to let visitors browse, select and purchase items, it’s called an eCommerce web site. When a web site builder lets you create web pages that has the ability to sell items with an online store and shopping cart, it would be considered an eCommerce website builder. Really, these days every business should be able to sell items online, and they can using an eCommerce website builder. Not long ago creating an eCommerce website was a difficult and expensive process. Because the task of building an eCommerce website was difficult and expensive, most small business owners would not know how to create an eCommerce web site or sell online. Instead, small business owners would opt to just display the product or talk about the services that they offer. Times have changed. Website builders have become easier to use, plus the most popular website builders have added in all of the features necessary to create an eCommerce web site. This is all done without programming or having to learn use complicated technology. In fact, many of the best eCommerce website builders are simple and intuitive to use. When you build an eCommerce website with a website builder you are creating the online store for your site visitors to be able to shop whenever they want and wherever they want. It’s like having another business branch online that is always available and only a click away. It’s probably safe to assume that just about everyone has purchased items online using sites like Amazon.com, Buy.com or Apple.com. These sites provide easy accessibility for users to find out more about the products offered, place wanted items into a virtual shopping cart and checkout by paying online. One an order is submitted and the payment has been made, the customer will receive an email receipt of their order. After that, the company that they ordered from, fulfills the order and ships it off to the customer. This entire process can also be performed by a small business owner that it just getting started working out of his or her garage. With the right eCommerce website builder, your own eCommerce web site can be up and ready to accept order literally within an hour. It’s really that easy. There are many choices when it comes to selecting an eCommerce website builder. We have reviewed and personally used many of these business site builders. Easysite.com is the right choice if you are just starting out. There’s nothing easier to use and no other site will get you up and running as quickly as Easysite can. If your company is larger and has lots of money to spend on eCommerce software development, then by all means, hire a company to create a custom eCommerce website design. Most businesses that are just getting started simply don’t have a lot of budget for web site development, this is where e-commerce website builders like Easysite fit in. Easy-to-use web site builders like Easysite are simple to use and cost very little. (Business web site builders start out around $20 per month and go up from there.) A lot of eCommerce website builders will actually let you start out your site for free to try it out and make sure it fits your needs. This is how Easysite works – every site starts out as a free 30-day trial with no obligation to purchase after the trial. I’m not very computer savvy, will I really be able to start selling online? Yes, believe us, you can do this. For us, the right web site builder for you to choose is the one that you will be able to use. Because we have reviewed and tried out many different site builders, we can recommend that you start by signing up for a free trial with Easysite.com. Like the name says, it’s easy. There is no programming, installations or server configurations. With Easysite, you don’t even need to have your own merchant account or even a secure certificate for your site. These are extra items that prolong the process of getting your site up, while adding costs to the site development. When you start to work on your eCommerce site, you simply click on the “store” page which can be named to whatever you would like within the Site Admin page. Once you’re in the store page, you enter your PayPal email address into an entry and you’re ready to get started. Easysite uses PayPal exclusively for a few reasons. First off, most everyone already has a PayPal account from buying something on the Internet from a site like eBay. Using PayPal also saves you from having to have a merchant account and secure certificate on your site. (Getting a merchant account can be as difficult as getting a mortgage – not a fun process.) Lastly Easysite processes order through PayPal because studies have shown that you will sell more by offering PayPal as a payment option to your customers, since most of them are already familiar with PayPal. Your customers don’t even need to have a PayPal account for you to be able to process their payment, the customer can simply use their credit card and PayPal will take care of the rest for you. Within the store page, the next thing that you create is a department for your items to be put into. If you sell clothing, your first department might be “shirts”. So you click the add department link, enter your new department name then click OK.
Once a department is created you’ll see a set of new links within the department. To add an item to the department, simply click the add item link to display the add item dialog box. This is where you enter the name of the item, along with a price as well as a picture or two. There are a lot of other options within this dialog, but the only two required fields are the item name and price. 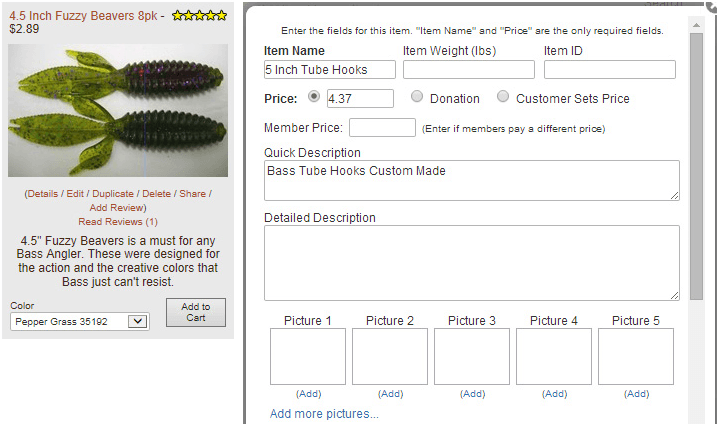 The other available options are used for tracking inventory, creating options (available sizes, colors, etc.) as well as enter more descriptive information about the item for sale. Once you have added an item to your online store, you’re ready to start selling. Watch a video about the eCommerce website builder. Once you have added an item to your online store, you’re ready to start selling. Congratulations, you’ve just create your own eCommerce website using Easysite.com, the easy eCommerce website builder.